Even though the holidays are over, a good roast never goes amiss and this one is no exception. Turkey breast – like chicken breast – tends to dry out, so here I followed the Voltaggio brothers’ lead and slathered my bird in mayonnaise to lock in moisture and render the skin crisp and golden. The results were perfect. I used homemade mayonnaise, but store bought will work well too. Just make sure whatever you’re using is good quality – and will taste delicious on leftover sadwiches! Happy roasting! 2. In a small bowl, combine the garlic, herbs, salt, pepper, and lemon juice to make a paste, then combine with mayonnaise. Season to taste if necessary. 3. 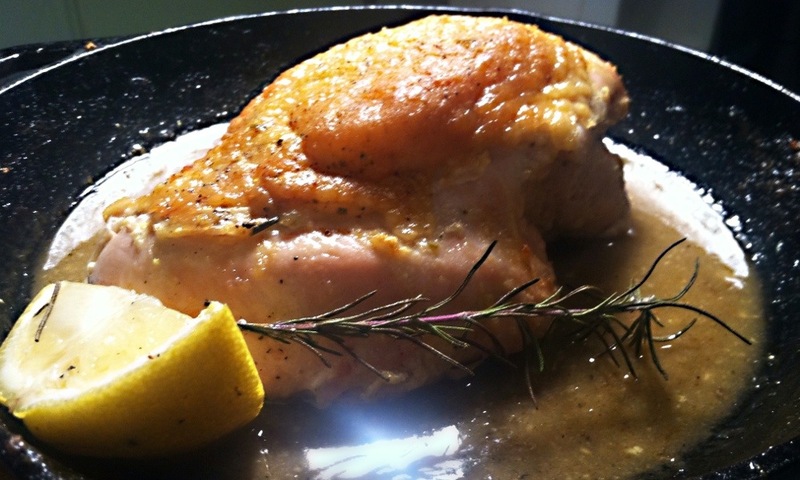 Place the turkey in a pan, then gently lift the skin and rub 1/4 cup of the mixture directly onto the meat. Lower the skin, and spread remaining mixture on top of the skin. Pour 1 cup of water into the bottom of the pan. 4. Roast the turkey for 1.5 hours, until the skin is golden brown and and a thermometer reads 165 degrees when inserted into the thickest part of the breast. If you don’t have a meat thermometer, make a small incision into the thickets part of the bird to make sure no pink remains. 5. When the turkey is done, cover with foil and rest at room temperature for 10 minutes or so. Cut into 1/2 inch slices and serve dressed with pan juices.